I have worked as an embroiderer and tutor throughout my career having taught classes in community education, exhibited, worked to commission and provided charts of my designs, I now give talks on embroidery and organise day schools and courses for beginners through to experienced embroiderers, both in the UK and abroad. I have just returned from teaching in Kenya and have taught in Canada and the USA where I will be returning in July 2018. I returned to college in 2006 to learn about web design and photography and in 2008 I started my own website “Blackwork Journey” to promote the technique of blackwork, pulled thread work, whitework and Japanese Kogin embroidery worldwide. The site is ten years old in November. Having travelled extensively throughout the Middle and Far East, Europe, Australia, Canada and the USA I have been fascinated by the architecture and designs I have seen and these have influenced many of my designs, which are available through my website and international distributors. 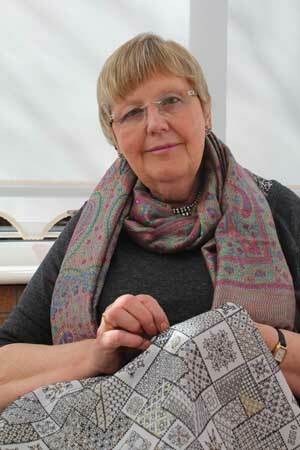 I also write articles for magazines such as “Just Cross Stitch” and “Cross Stitch and Embroidery” and have contributed to a number of books and calendars. I am currently working to promote a number of different techniques, especially Japanese Kogin embroidery, pulled thread work, blackwork and embroidery into quilting. I have also completed a series of large projects on my website which I designed to encourage people to share their love of embroidery with me. These projects have been very successful and associated with “Blackwork Journey” are four closed Facebook groups with over 5,000 members worldwide who work on my designs and receive advice and companionship from being part of these very lively groups. I look forward to the next ten years!